I snapped this photo of the newly opened Fayetteville Street Mall on a dreary January day in 1978. I had just returned to Raleigh after a 3-year stint away at school. This was my first look at the transformed street, and I must admit, I was not impressed. For some reason an image of cold-war era East Berlin kept flashing through my head. 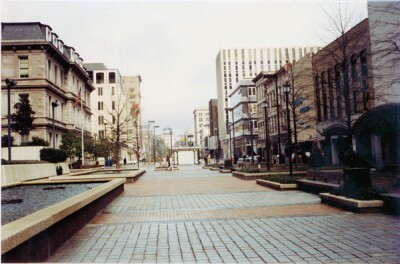 It’s been 31 years since I saw the mall for the first time, and now Fayetteville Street has just recently been restored to its original purpose — parade ground and all. I’ll admit though, today I’m a little apprehensive about another project currently underway to remake yet another of Raleigh’s axial streets — Hillsboro. Work has just begun on that thoroughfare, and the street is being torn up — heavy roadwork equipment, orange and white traffic barrels, piles of red dirt… I am experiencing a strong sense of déja vu. In store for Hillsboro Street are roundabouts, 2-lane traffic on on a major traffic artery, a raised median down the middle of the street — hmmm? Wonder if I’ll be around 31 years hence to see what becomes of this particular experiment in city planning? Although I share your sentiments, I must remain optimistic about the whole project. I just wish I had gotten pictures before they put cones and construction equipment all over the place. Yes, Ian, I too am (cautiously) optimistic about the Hillsboro Street project. I have started documenting it with my camera. Hope to see you out there doing same! My father / my father’s construction company – Construction Management Co., built the Fayetteville Street Mall. In 1976 I believe, he/they began demolishing it as part an urgan renewal project that was to attract people and business back to downtown. Much of the demolition leading up to the new construction centered around digging up the former Raleigh street car tracks and infrastructure that was buried under asphalt, concrete, and even some cobblestone. I still have a set of 4 bookends he made from cross-section cuts of re-claimed track. My sister has a coat rack made from the spikes. It’s ironic that 30 some odd years later, my dad’s work was also demolished and replaced to renew our downtown. yeah…FSM was a bit angular. but theos plant boxes made excellent outdoor lunch time seats. i used FSM as a transit rider and employee downtown for a while and loved it. city , count and state employees filled it at lunchtime. on weekends i skateboarded and rode my bike there. 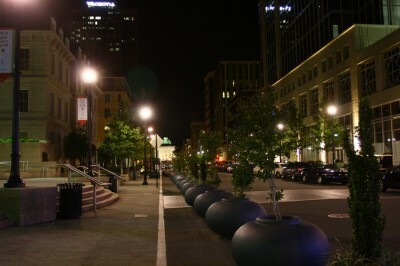 it was a sane bit of downtown that allowed one to meander and relax with good sight lines. i think that big mirrored clock tower got drizzled with pigeon poop.